Tuttle Pocket Hindi Dictionary is the most up-to-date and portable Hindi-English and English-Hindi dictionary available today. It contains a comprehensive range of contemporary Hindi vocabulary and phrases including Internet and social media terms. This Hindi dictionary is specifically designed to meet the needs of English speakers who are studying or using the Hindi language on a daily basis. It contains over 14,000 entries including all vocabulary (in both directions) in common, everyday use in India today. 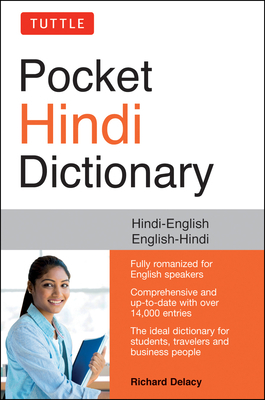 Pocket Hindi Dictionary is fully Romanized, and the Hindi-English section is organized alphabetically. Both Romanized forms and Devanagari forms are given for all Hindi words and expressions. Richard Delacy has taught at several universities in Australia and the U.S. and currently teaches Hindi/Urdu at Harvard University. He completed a BA with honors at the University of Melbourne in History and an MA in history from Monash University, with a focus on modern South Asian history and twentieth-century Hindi/Urdu language and its literature. He studied Hindi formally for three years as a part of his BA and then spent a year in Delhi studying Hindi language and literature at the Kendriya Hindi Sansthan (Central Hindi Institute). He also taught Hindi at two universities in Melbourne for nearly six years before embarking on further studies in South Asian Languages and Literatures at the University of Chicago. He is the author of Teach Yourself Beginner's Urdu Script (McGraw-Hill) and Hindi in a Flash (Tuttle) and co-author of the Hindi, Urdu & Bengali Lonely Planet Phrasebook. He travels back to India as frequently as he can and has many close friends there.